Senior military leaders listen to the results of studies conducted on recruiting challenges during the second part of the Recruiting 2025 summit at Fort Knox, Kentucky, June 2 and 3. A two-day summit focused on developing solutions for the recruiting challenges facing the U.S. military and the future of the all-volunteer force wrapped up at Fort Knox, Kentucky June 3. 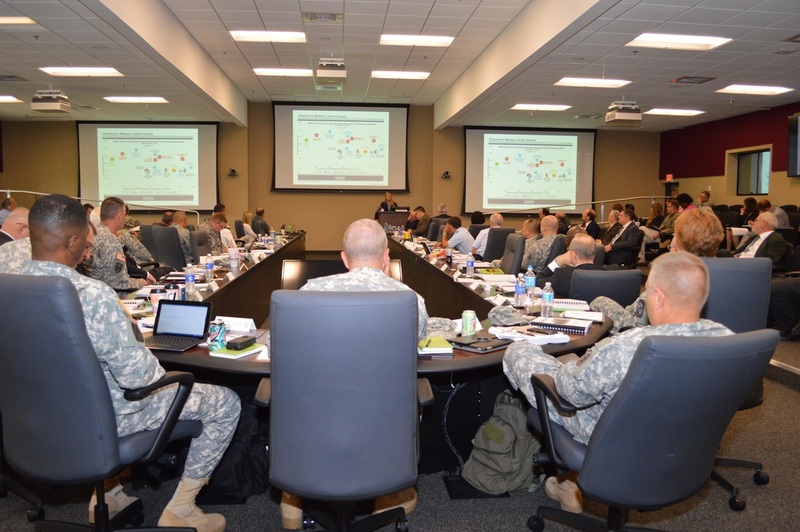 More than 100 defense researchers and senior military leaders from the Department of Defense as well as the Army, Navy, Air Force, Marines and Coast Guard attended the Recruiting 2025 Summit, hosted by U.S. Army Recruiting Command, headquartered at Fort Knox. The summit is part of an ongoing joint recruiting discussion, which kicked off at RAND Corporation in Arlington, Virginia, in September and will continue in December at the Institute of Defense Analysis. During the summit at Fort Knox, 16 teams presented research papers offering possible courses of action to overcome critical issues facing military recruiting efforts. The papers covered topics such as attracting the right people for the right jobs, measuring abilities and attributes, determining quality measures, supply and demand, and recruiting foreign-born nationals. The Military Accessions Vital to the National Interest program allows a certain number of foreign born nationals to enlist periodically during times of war. The Army is allowed to enlist 3000 MAVNI applicants for fiscal year 2015 and 5000 for fiscal year 2016. Margaret Stock, co-author of the “The Impact and Potential of American’s Foreign Born Population on Army Recruiting and Force 2025,” said there is a bill in the House of Representatives to make the MAVNI program permanent. Recruiting statistics have shown that foreign-born nationals who’ve enlisted in the Army have higher Armed Forces Qualification Test scores, much lower attrition and Future Soldier loss rates than American citizens who’ve enlisted, and 71 percent of them have college degrees. The millennial generation was another key topic of discussion throughout the summit. Debra S. Wada, Assistant Secretary of the Army Manpower & Reserve Affairs, said in order to attract millennials, the Army has to recognize what drives them and how to reach them. All branches of the U.S. military are competing for talent in an environment where talent is more expensive to acquire, according to Maj. Gen. Allen Batschelet, USAREC commanding general. He believes the Army needs to focus on how it approaches the research, development, management, identification and selection of the people who serve. Batschelet said if the Army wants to be more sophisticated in the way it acquires and grows talent, it needs to do away with the one-size-fits-all approach in selecting people to serve. These questions and many more will be discussed at the next joint recruiting summit, which is scheduled to examine the potential use of emerging technologies to aid in the precise identification and selection of individuals best suited for positions in the Armed Forces.